১. All 115 students in a class play football or cricket or both . 65 play cricket and 60 play football. How many students play both ? ২. "Bari has been selected as the new captain of the football team , so he must be true brightest boy in the team." ৪. The average of 6 numbers is 25. If 3 more numbers , with an average of 22 are added to these numbers ,what will be the average of the combined 9 numbers? ৫. How many flowers are there if all of them are roses except two , all of them are tulips except two and all of them are daisies except two? ৬. The day before yesterday is three days after Saturday. What day is it today? ৮. which figure is the odd one out? ৯. 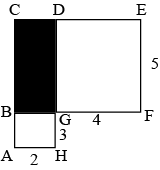 In the figure below ACDH and BCEF are rectangles , AH = 3 , GH =3 , and EF =6 , what is the area of BCDG ? ১০. Find out the missing figure . ১১. What is 30% of 11/45 of 150 ? ১২. who wins in the race ? ১৩. who comes in between Ali & Drabir? ১৪. which number should replace the question mark? ১৫. which number should replace the question mark? ২০. 50 girls and 100 boys were invited to a party . If 30% of the girls and 75% of the boys attend the party , what percentage of guests attended ?